While not at the forefront of UK or Irish betting, our European counterparts will be very familiar with Bwin, as the company has been an established sports betting and gaming operator in Europe for quite a number of years. Even those not too familiar with the Bwin betting interface, may be aware of the sponsorship deals, given that Bwin has been at the forefront of our TV screens in the form of sponsorships of football teams like Real Madrid, Juventus, or Bayern Munich. Fear not, the company is extremely reputable, and their Bwin mobile app offering is definitely worth trying out. The bwin app on iphone or android is extremely user-friendly, & via Bwin’s partnership with Geniebet, you’ll also be able to claim a Bwin sign up offer. Further details are highlighted below. 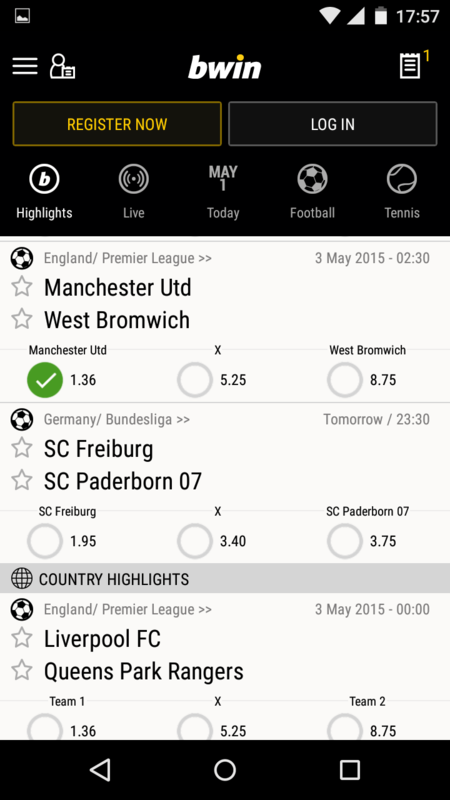 Download the Bwin app now! Simple navigation and use of android app native features. In-play cash out/pay out on selected markets. Vast array of sports events & markets, including some obscure markets. Self-help content & easy access to customer service. Responsive design for landscape viewing. Live streaming of selected sports. Multi-bets insurance via Bwin ‘Protektor’ feature. As betting apps go, the Bwin mobile app is one of the simpler & more stylish apps in the market, and somewhat differentiates itself from it’s competitor offerings, by means of having its own unique styling, whereas many other mobile apps are quite similar in styling. 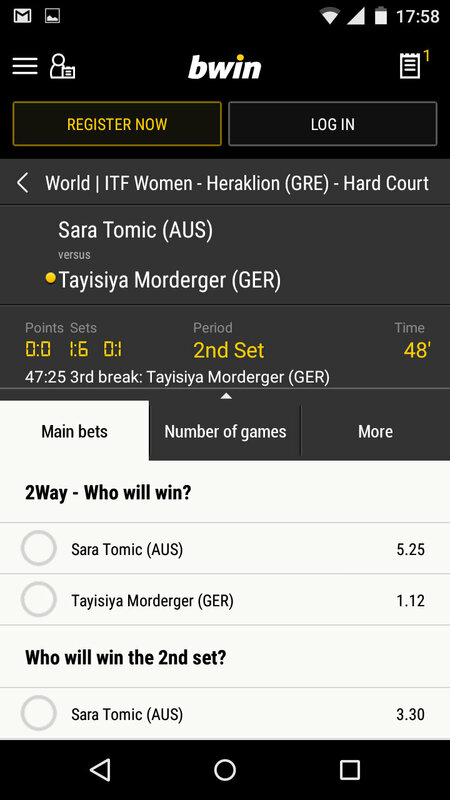 The styling of the Bwin android app obviously uses the Bwin black and gold theme, which works quite well and doesn’t offend. As with other betting apps available for download, the navigation follows a format that all but the most inexperienced bettors would be unaccustomed to. A couple of examples are shown below. Go to Bwin now and get a free bet! Availability of the Bwin iPhone app is currently restricted to customers from the following countries: Austria, Czech Republic, Estonia, Germany, Netherlands, Portugal, Slovakia, Sweden and the United Kingdom. As with most android apps, availability of the Bwin Android app is not restricted based on geolocation, and the Bwin mobile app is freely available to customers from most countries.